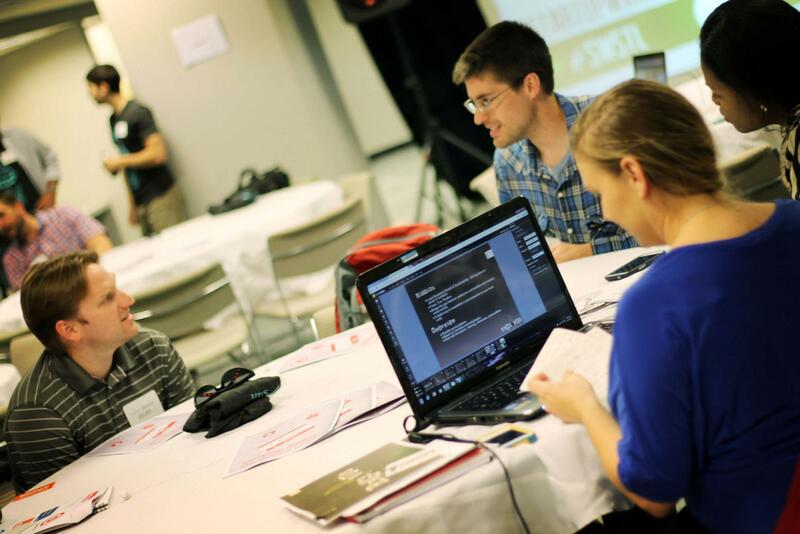 Home » Featured Stories » Five Questions About the 2014 St. Louis Startup Weekend. Five Questions About the 2014 St. Louis Startup Weekend. The T-REX building, the co-working space located at 911 Washington Avenue in downtown St. Louis, is a high-energy place just about every day, serving as the home base for more than 100 innovative local startup companies. Starting Friday night, November 14 and running through the rest of that weekend until Sunday night, November 16, the T-Rex energy level will be turned up several notches higher, as the building plays host to another Startup Weekend. The 54-hour event brings together developers, designers, marketers, product managers and startup enthusiasts, who share ideas, form teams, build products, and launch startups. The St. Louis event is part of an initiative that features similar events in cities around the world. Teams organically form around the top ideas, as determined by popular vote, and then it’s a round-the-clock frenzy of business model creation, building, designing, and market validation. The weekend culminates with Sunday evening presentations in front of a panel of local judges, who are faced with the often-difficult task for selecting the winning teams. InnoVox STL: There are some other “pitch” or startup competitions around the area. What makes Startup Weekend different? Matt Menietti: First off, Startup Weekend is all about action. People are actually putting in the time and doing the work you’d need to launch a startup company. This isn’t conceptual. You’re building real things. Talking to potential customers. Working on a real team. This active and intense interaction is unlike most typical pitch events. Startup Weekend gets people off the sidelines and truly immersed into the actual process of building a startup company. InnoVox STL: The makeup of the panel of judges can be important. Do you have your judges lined up? Matt Menietti: We’ll be announcing our judge panel shortly but I can tell you that we have a really solid, diverse group of folks lined up who will be helping us pick the winners this year. We were intentional about balancing startup and venture capital people with representatives from the creative, political, and nonprofit worlds. That broad spectrum is really important so that we’re viewing these companies from all sorts of different angles. InnoVox STL: Last year, the winning startup was Invisible Girlfriend, which provides faux social proof of a girlfriend. Some questioned that choice. What do you say? Matt Menietti: Some might question it, but how many of the startup companies that are around today might face that same critique? Look at Yo! – which is basically a modern day pager, or something like Tinder, a new online dating app, both of which have raised millions of dollars in venture capital funds and have millions of users. To reframe, I think the bigger story was that the team behind Invisible Girlfriend is incredibly talented, and in a matter of three days, put together a really impressive app from a technology and design perspective, and they had a lot of fun doing it. They executed extremely well and the judges saw that. The relationships formed as a result of this team and others are incredibly valuable to our local startup scene. InnoVox STL: How are ticket sales going? You had a packed house last year. Matt Menietti: We’ve had a good wave of pre-orders for the event and we’re on track to have similar attendance this year. Admission is $79 for the entire weekend and includes your meals, snacks, drinks, and a sweet Startup Weekend t-shirt to boot. Students and graphic designers can get in for only $49. You can sign up right up until the pitches start on Friday night. InnoVox STL: At the end of the weekend, what do you hope you will have accomplished with the event? Matt Menietti: I think there are several way to gauge our success. First, are there any teams that choose to continue to work on their concept past the weekend? We’ve certainly had that happen several times for past events. But indirectly, did we connect people who would have never met except through Startup Weekend. A lone entrepreneur in search of a co-founder. Someone in need of a great new logo who met a graphic designer. A student looking to get immersed into the St. Louis startup scene. Those are harder to measure, but in my opinion, much more valuable.